The WPA-funded mural on the west wall of Linden’s 1930s Federal Post Office. The painting, entitled The Last Crop, was conceived specifically for the Linden PO by Viktor Arnatoff, a young Russian émigré who came to the United States seeking an artistic career. Another prominent example of Arnatoff’s work is a great mural inside Coit Tower, landmark site on Telegraph Hill overlooking San Francisco Bay. These murals both sympathetically celebrate the people who tackle the hard work of building America — a recurring theme throughout Arnatoff’s career. The Linden Heritage Foundation was founded by Sue M. Lazara, Sam L. Higdon, Joe B. Lovelace, and James S. Jacob in September of 2015 as a nonprofit corporation to encourage the preservation of all significant historic structures, archeological sites, objects and customs relating to the heritage and uniqueness of the city of Linden and all that is historically admirable and distinctive in it. The Foundation first project will be the historic Linden water tower. The tower was constructed under a Works Progress Administration program facilitated by Linden’s Congressman Wright Patman. It bears a manufacturer’s identification plate showing that it is one of the celebrated “HORTON TANK” design produced by the Chicago Bridge and Iron Company. Many of these beautifully engineered towers gave way long ago to larger tanks, but a few are still standing and have won historic recognition on the state and national registers. In early July of 2015 the City of Linden entered into a contract to demolish the city’s 1934 water tower, which had been scheduled for elective decommissioning as part of a major city infrastructure upgrade. Immediately, citizens rallied around an effort to “Save the Tower” due to its historical novelty, contribution to the town skyline, and recent prominence in the video promotion of native son Don Henley’s newest album, Cass County. Funded by water tower supporter Don Henley, an recent independent engineering study has professionally assessed the tower’s structural stability, recommended repairs, and cost options. To read more about about the preservation of the water tower, go to the Water Tower page on our website. Seals and logos have been used throughout history to embody the identity and inherent purpose of governments, families, business and social organizations, and other entities. This new Linden Heritage Foundation Seal, prominently featuring one of Linden’s lighted historic streetlamps, grew out of discussions between Jim Jacob, Anna Barber, and Sue Lazara. The group wanted an image uniquely and tangibly associated with historic Linden and exemplifying the goals and activities of the foundation itself. But where do you find such an image? As principal initial projects, the Linden Heritage Foundation is working to preserve and re-purpose the town’s 1934 Water Tower and 1939 Firehouse. Consistent with the organizational charter, the Foundation will also be tackling a range of related town enhancement challenges such as research for landmark designations, grant writing for resource conservation, heritage education to the local population, and technical assistance to owners of other historic properties who want be good stewards of their own special buildings. Neil’s photo features a lighted 1934 streetlamp on the southeast corner of the Cass County Courthouse lawn. 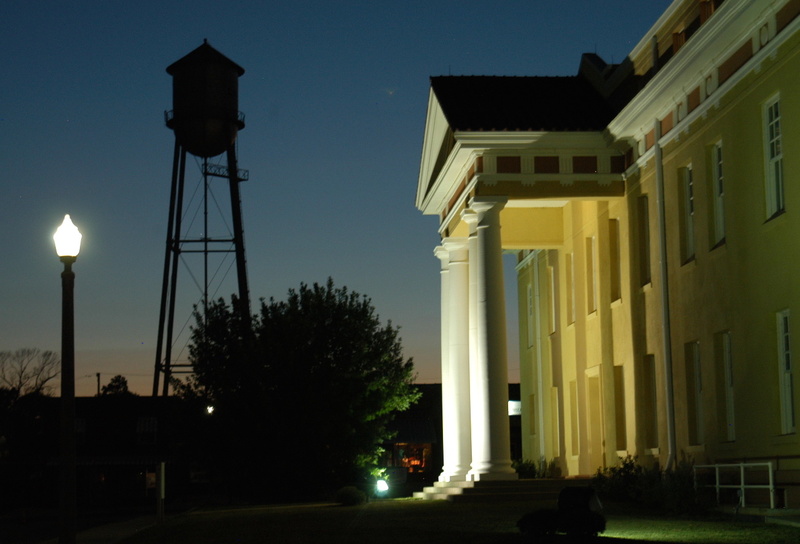 Together with the stately south portico of the courthouse, the lamp frames a shadowy outline in the background – Linden’s now famous historic Water Tower. The photo manages to suggest that the tower is on duty as a special night guard over the town. Since a fundamental goal of the Linden Heritage Foundation is to energize and illuminate our own town’s special possibilities and heritage resources, it hit us that a solitary, glowing 1934 streetlight could provide a strong conceptual graphic on a new organizational seal. Aware that artist and master printer Scott Farris possesses the toolbox and the eye to put such ideas into visual format, Anna Barber consulted Scott that same evening. He immediately caught the vision and in short order produced the seal shown above — combining the visual reference to “illumination” with a tangible tie to the historic and present-day landscape of downtown Linden. Nature and Neil Abeles’ photographic image determined the coloration at the center of the seal. For the outer ring on which the Foundation’s name is inscribed, Scott agreed that a rust-red color – taken from the Courthouse frieze at the geographic heart of the town — would do nicely. Not only is that color part of Linden’s own authentic heritage but red has been throughout time a universal reference to hospitality, energy, passion, and love. That same hospitality, energy, passion, and love are what the Linden Heritage Foundation intends to exemplify as we work to make Linden ever stronger and ever brighter. History of the Foundation seal written by Sue Morris Lazara. The Linden Heritage Foundation invites all persons interested in preserving the architecture and cultural heritage of Linden to become a part of the Foundation by visiting our Donations and Membership pages.